Whoever that came up with the popular saying that love is wicked hasn't really falling in love because love is the only thing that can bring two different souls together in respective of their tribes or societal norms and these soon to be couple just found theirs. A Nigerian couple have gone viral after they released adorable photos from their pre-wedding shoot session. 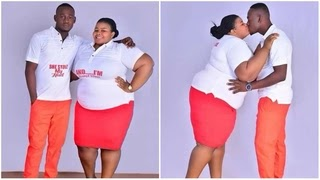 The plus-sized bride-to-be, Ifeoma might have defeated societal beauty standards, but to her man, Chidera she's the epitome of beauty and grace. Their love must have blossomed after Ify showed Chidi that love lives in the heart and not in the huge curves she possesses. The groom-to-be saw a lovely flower and decided he will tend to it and watch is grown even more beautiful. 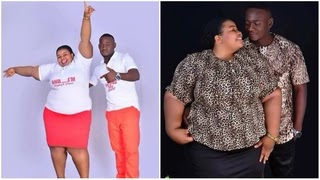 As they have gotten the attention of social media users with their photos, many are wishing them a big congratulations as they tie the knot on April 14. Wedding bells are now ringing loud and clear for the lovers. 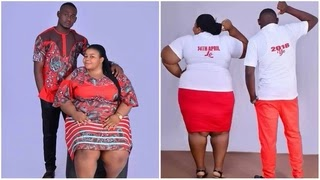 While quite a number of people congratulated them and hailed the guy for his courage to marry a lady of that size, some other ladies tried to use the medium to pass a message across to the world. This simply teaches everyone a very simple lesson. That no matter how you look of what you are, you will always find that one person that rhymes with your own heart beat.